We have hit the last of the scans, and all these cards came from Nick over and Dime Boxes. When Nick and I met up for some box digging at the Orland show, my partner in dime and nickel box crime exchanged boxes of cards. Nick really built up a stack, handing me a box at least twice the size of what I gave to him. 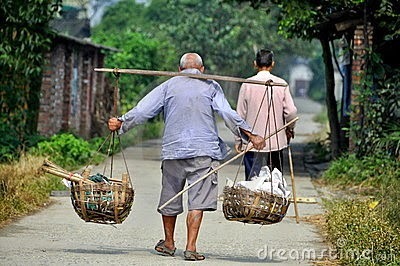 Then, he weighed himself back down with his purchases. There's Hostess cards 3 for a buck over here. The box Nick gave me had about 700 or so cards within. I sorted them down to four groups: Throwbacks, bunting, double plays and White Sox. So as not to kill you with hundreds of scans, we'll highlight each group. Over a hundred cards of players in throwbacks start of the showcase. 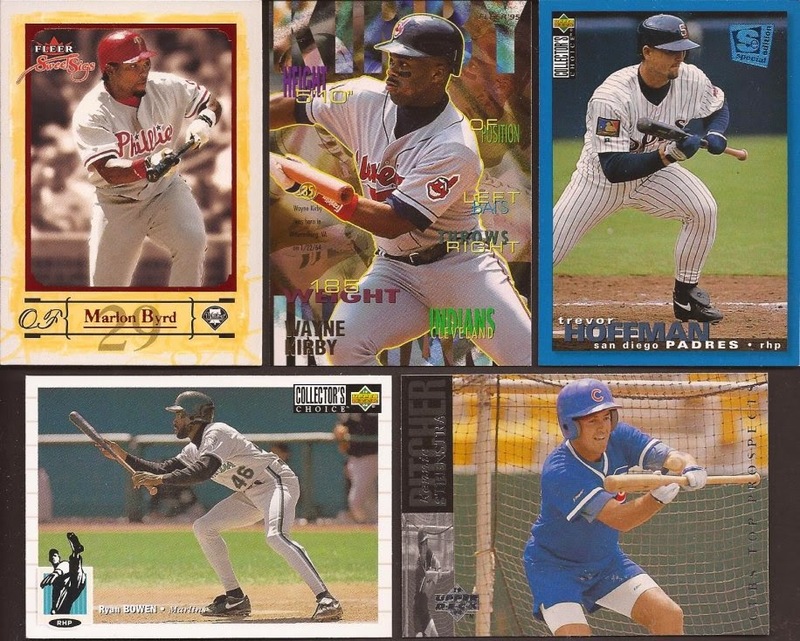 Just 25 were new, and you see a few of those new binder additions here. I forgot about the Senators throwbacks from a couple years ago. Absolutely love the Studio Heritage Series that features Molitor in the upper right. I'm working on getting all of those inserts from the three years they had them. 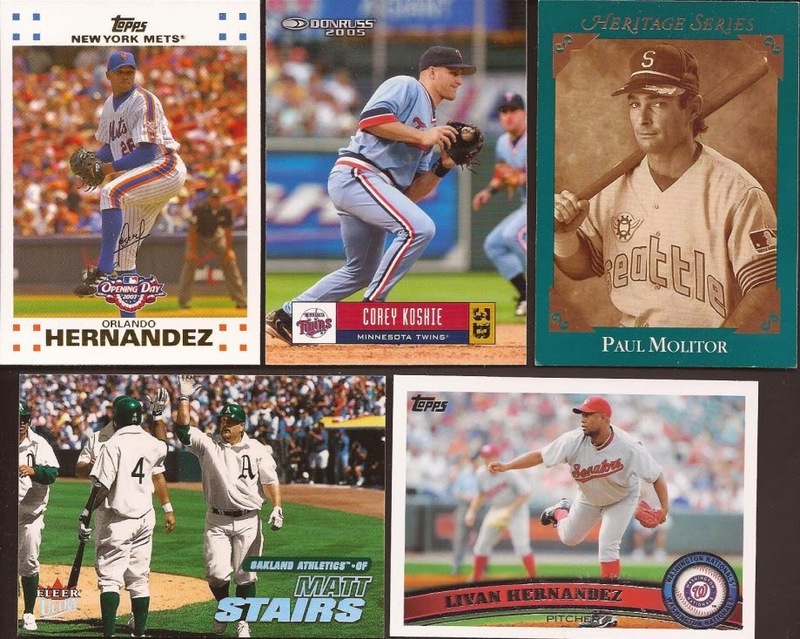 Some of the throwbacks that didn't make the cut made it into the Sox box, so there was plenty of use for the dupes. Over 60 cards of players trying to bunt their way onto base, or setup a run. About half (30) were brand new to the binder. That Marlon Byrd is really nice in person. It's almost gaudy, but compared to the '95 Fleer beside it..... Three pitchers at the plate, so I know those are dupes to Nick. For the turn at second, Nick had about 120 SP cards in the box, of which 47 were brand new and a dozen went either into the Sox box, or towards junk wax era UD sets. Cabrera in the middle is trying out for a revival of West Side Story. Hubie has a rare pitcher in a warm up jacket cameo. It's hard to find a bad Stadium Club card, as the Pena image attests. 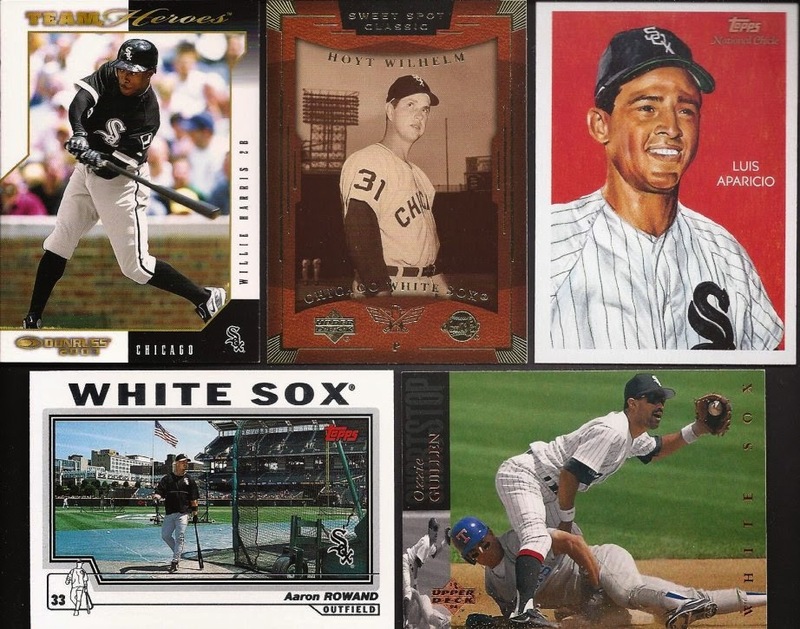 Lastly, just short of 300 straight up White Sox cards that fit into none of the previous categories. I must get that Rowand TTM'd. 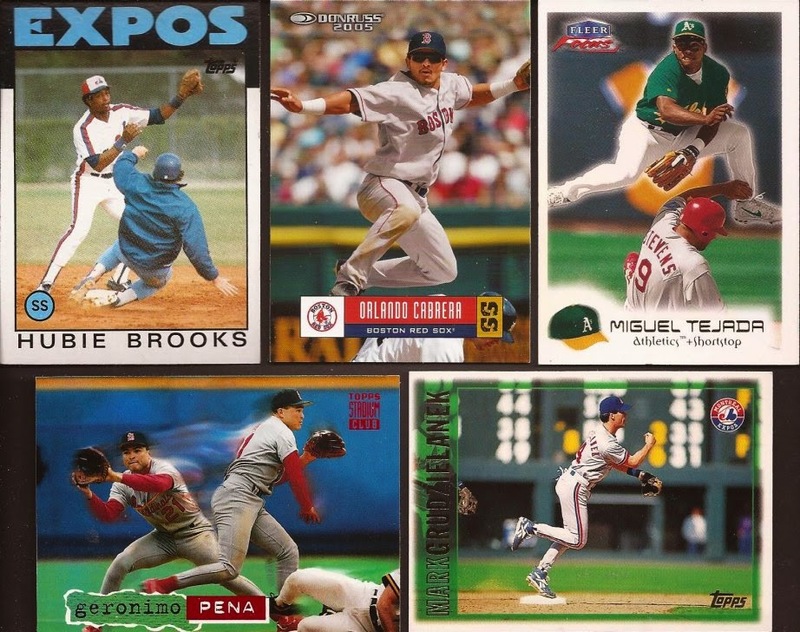 2015 Topps can learn a lot from 2004 Topps. The Team Heroes in the upper left is just begging to be a diecut. Nick, as always, thanks for the cards. I can look at my collection and know some came from your digging, one dime at a time or less. Glad you enjoyed the box, Jeff! I'd been stockpiling those cards for a while.